Welcome to The Plan of Attack! Want to learn more about our Christ-centered, comprehensive, step-by-step, 30 day action plan & tutorial to online prosperity? So what is The Plan of Attack? Great question! We knew you were a smart one. 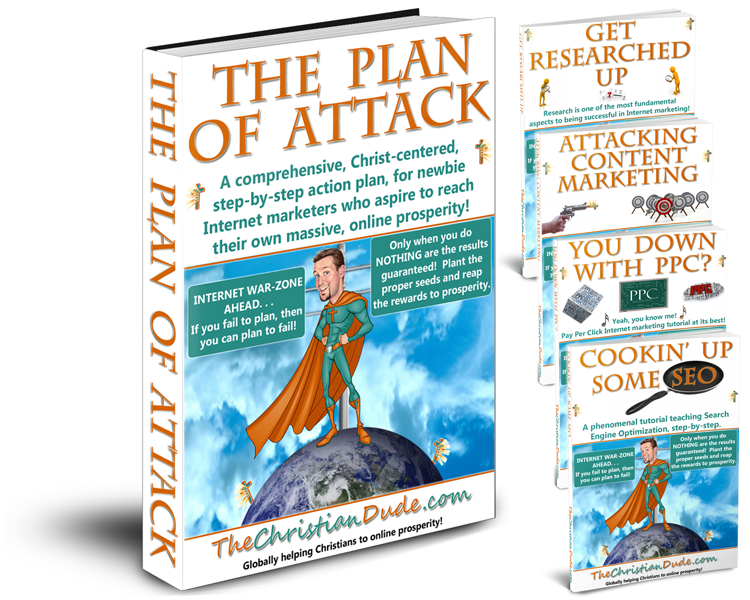 The Plan of Attack is one-of-a-kind, in-depth tutorial for brand-spanking new Internet marketer wannabe’s from a Christ-centered perspective. It says right on our cover, “If you fail to plan, then you can plan to fail”, and nowhere is that more true than from the perspective of aspiring Internet marketers! You absolutely must have a “plan of attack” to have a chance, let alone succeed in Internet marketing. Did you know that 95% of all Internet marketers fail? Well, this action-based tutorial launches you and your Christian home business off on the right foot. That is what The Plan of Attack is about, is teaching you how to prosper from affiliate marketing… and most importantly, from a uniquely Christ-centered perspective. Christian approaches to doing business give you the best chance at starting your own, thriving, Christian home business or Christian work from home opportunity. This technologically-driven day and age in which we live has basically turned the world into a global marketplace, and this of course is in large part due to the advent of the Internet. 25 years ago, “work from home” meant a guy who had a repair shop of some sort in his garage, or the rise of network and multi-level marketing such as Amway. Only since the Internet has arrived, have true work-from-home opportunities arisen. Only by prospering from online endeavors can someone truly stay-at-home, never leave, and create wealth from the comforts of their own home. It is truly an amazing thing! Internet marketing is my sole income. I have no other job, I am a full time Internet marketer. It took me years to get to this point, and I praise God for His blessing’s in this. I have to say though, I wish I had a guide like this when I got started! I have spent more money on products, tutorials, and yes, way too many of those, “Learn my super, ultra, amazingly fantastic secret to how I made $10,000 overnight!! !” than I care to admit. Unfortunately, you end up with hype and fluff, versus substance and reality, or a legitimate Christian home business opportunity for that matter. There are a few things I have learned through all of this. One, is that Internet marketing is not easy. You see, it’s simple, but it’s not easy because you do have to work at it. Two, there is no such thing as “get rich quick”! Can you make $5,000 or more in your first 60 days? Yes, that is absolutely possible. Likely? No, it’s not likely because most will not commit the proper time… but if you are one of the rare few who will commit to this process, diligently work at it 8 hours a day, and literally work your tail off, it is 100% possible! A third thing that I’ve also taken note of is that there is absolutely none, zero, nada, zilch, in the way of Christ-centered products for Internet marketing! Further, one thing that is beautiful about Internet marketing, is that once you set in place a successful marketing campaign, you can essentially “set it and forget it” and make residual, recurring income! Find a successful campaign? Excellent! Now, you begin building your next campaign. And then the next… and then the next… and then… Once you learn how to do this, your prosperity is a beautiful, inevitable, and growing thing! So, Christian work-from-home opportunities may be rare, but we are working to change that! For only $59, you can begin your path to Internet prosperity! This is strictly a one-time fee, and there are no recurring charges of any kind. Don’t keep doing what you’ve always done and expect a different result, instead commit to step 1 of your Christian home business opportunity! If you are willing to bless us with the chance to serve you, we will not disappoint. We hope you give us a chance. Regardless of what you decide, our prayer is that whatever endeavor you pursue, that God will bless you WILDLY! Buy The Plan of Attack right now for $59, start your own Christian work-from-home, Christian home based business by simply clicking on the ‘Buy Now‘ button, below.